A number of years ago I was sitting in a church service listening to the minister introduce his sermon topic for the day. One of the first things he said was, “Close your Bibles and put them on the floor. I’ve got something to tell you this morning.” Smacks of Bibles hitting linoleum is a sound I hope never to hear again. While teenage me wasn’t brave enough to stand up and walk out, I did keep my Bible open in my lap so I could do my own study while he lectured on American history. The United States of America, rather than something out of the Bible, should feel like a strange topic for a sermon. And yet I’ve heard other sermons, though much less extreme, preached about this topic on a fairly regular basis. Typically, it’s presented as something like “the Biblical history of our country” or “America’s Christian heritage.” The speakers usually do turn to scriptures, but they may spend more time quoting founding fathers and presidents than they do Jesus. Now, please don’t misunderstand me. This isn’t a rant against my country or an article condemning people who love the U.S. of A (which is why I didn’t post this 4th of July weekend, though it would have probably gotten more views then). Nor am I saying Christians teachers shouldn’t quote writings outside the Bible. 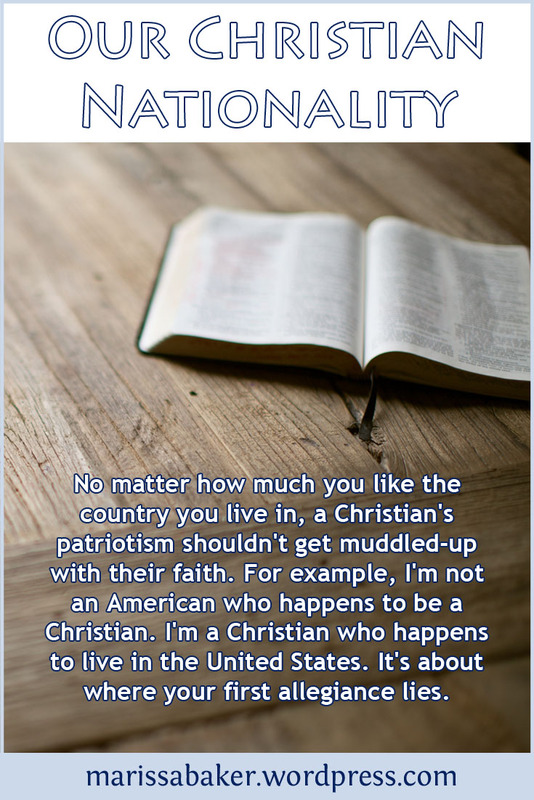 My concern is that patriotism for our physical nation has gotten muddled up with our Christian faith as if the two are, or should be, interconnected. But I don’t think they should be. When Jesus walked this earth, He said He was “not of this world” (John 8:23, KJV). At the Passover, He started describing His followers that way as well (John 15:19; 17:14-16). We still have to live in this world, as Paul points out in 1 Cor. 5:10, but we don’t belong to it. “We know that we are of God, and the whole world lieth in wickedness” (1 John 5:19, KJV). The present world is evil because it has fallen into sin and is under Satan’s sway (Gal. 1:4; John 14:30). I think most Christians would agree with that at least to a certain extent, otherwise we’d have no need for a Savior. But often, we think of this world’s evil as an abstraction. The world “out there” is wicked, “society” is evil, or there’s a spirit of wickedness at large “somewhere.” But maybe my neighborhood, this city, our country isn’t really all that bad. Here in the U.S., we don’t yet face the sort of persecution that would serve as a constant reminder that this world isn’t a Christian’s home. I’m thankful for that, but I also wonder if it has made us lose sight of some important truths. The United States was founded with some Christian principles and a guarantee of a religious freedom, but it was never a “Christian nation” and it hadn’t even looked like one for a long time. And while you have the right as an American to get involved in pushing your country toward where you’d like it to go and a duty as a Christian to stand up for what’s right in God’s sight, this physical nation isn’t where we owe our primary allegiance. Before His death, Jesus told Pilate, “My Kingdom is not of this world. If my Kingdom were of this world, then my servants would fight, that I wouldn’t be delivered to the Jews. But now my Kingdom is not from here” (John 18:36, WEB). Of course, this refers to a specific moment in history where rescuing Christ from death wouldn’t have fit with God’s plan. But the point still stands. Christ’s kingdom isn’t here on earth at this time (except inside believers’ hearts; Luke 17:21), yet that’s the kingdom we’re meant to pour our energy into. When we stand against wickedness, shine Christ’s light, and preach God’s word, we’re not doing it in an attempt to save this present world. We’re doing it with the focus of pointing people toward God’s kingdom. This puts Christians in the unique position of being a citizen of a physical nation here on earth while really belonging to the kingdom of God. And it’s clear where our first loyalty must lie, “For our citizenship is in heaven, from where we also wait for a Savior, the Lord Jesus Christ” (Phil. 3:20, WEB). Yet that doesn’t mean we can’t do good in this world. Consider the example of Private Desmond Doss (you can read his story by clicking here). Doss felt it was his duty to serve in the military during World War II, but was also determined to honor God by not taking a human life or breaking the Sabbath. The only time he did work on a Sabbath was when he personally saved 75 lives by carrying them to safety under heavy fire on Hacksaw Ridge, all without a weapon to defend himself. He’s fantastic example of a man who served his country while maintaining his first loyalty to God. There’s a summary statement in the middle of the faith chapter that calls our attention to something God’s followers have in common. Heroes of faith were devoted to seeking something they knew couldn’t be found anywhere on earth. Can we suggest that this implies God would have been ashamed to be called their God if they’d chosen their earthly nations over the heavenly homeland? I think so. If we can’t prioritize Him over our other allegiances, commitments, and relationships then we’re not, in Jesus’ words, “fit for God’s kingdom” (Luke 9:61-62, WEB). When God established the nation of ancient Israel, it’s governing structure was based in His character and laws. It was meant to be the most godly nation in the world. And yet God said, “the land is mine; for ye are strangers and sojourners with me” (Lev. 25:23, KJV). Even in the only nation ever set up by God Himself, the people weren’t to think of it as something that belonged to them. How much more should we, living in an ungodly world, recognize this nation doesn’t belong to us and is not where we belong? When God calls us, we have a choice whether we pursue citizenship in the kingdom of heaven or stay in the world. If we chose God, then we figuratively die with Christ to the world and start a new life with Him as our king (see Rom. 6:5-8; Gal. 2:20). We immigrate out of the world so we can integrate into God’s culture. And we do that even while still living in the world. That’s why Christians seem so weird to non-Christians. We’re part of a culture that’s alien to them. We’re not here to fit in or make people like us. God has called us to come out of this world and we belong to Him. No matter what our original background, our prime allegiance must now be to God. You’re not an American who happens to be a Christian. You’re a Christian who happens to live in the United States (or whichever country you call home; I know not all my readers are from the U.S. and apologize for how American-focused today’s post is). The other people we should most strongly ally with are our fellow believers. The Christians dying right now in the Middle East for their faith are more our countrymen than the atheist living just down the street. That certainly doesn’t mean you don’t love our hypothetical atheist as you do yourself, but on a spiritual level he’s your neighbor not your kinsman. The country I live in is not where I belong. It’s a temporary residence and it’s been a good one. Compared to the rest of the world, Christians in the U.S. are living safe and cushy lives. But no matter how good I think my country is or could be, I don’t incorporate it into my faith. Your faith shouldn’t have much of anything to do with where you live. 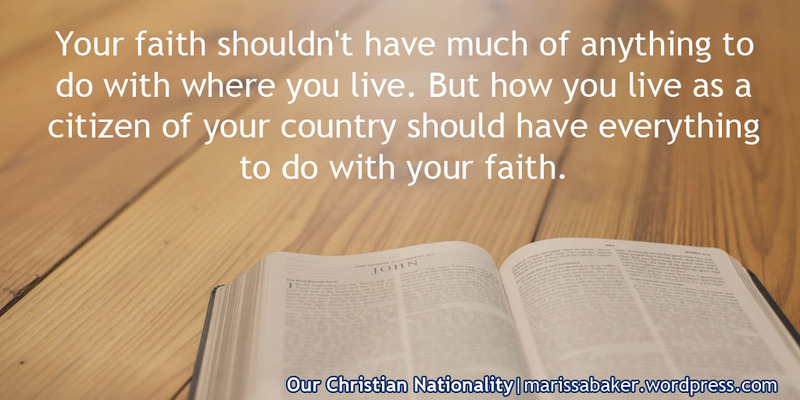 But how you live as a citizen of your country should have everything to do with your faith. It’s about where our priorities lie. Here’s just one example to think about: When someone persecutes you for your faith (even in a little thing, like making a snide comment), do you get offended because they shouldn’t treat an American like that or do you rejoice that you “were counted worthy to suffer dishonor for Jesus name?” (Acts 5:41, WEB). I’m afraid my first reaction is more American than Biblical in that sort of situation, but I’m trying to shift my perspective. I understand wanting to make the country you live in a more godly nation. And when we’re fighting for important moral issues that mean we’re standing for God’s truth, I think He looks favorably on that. And so we keep fighting injustice, preaching moral truth, and calling for a return to God because it’s what Christians shining as lights in the world should do. But “the world is passing away with its lusts” and no matter how much good we do in it the physical nation it won’t endure (1 John 2:17, WEB). The only truly lasting impact we can have is on other people. Our Lord is focused on saving lives, not making earthly nations into utopias. And we should be, too, as we live our lives as citizens of heaven sojourning here on the earth.